For years our family has enjoyed the biscuit donut holes. 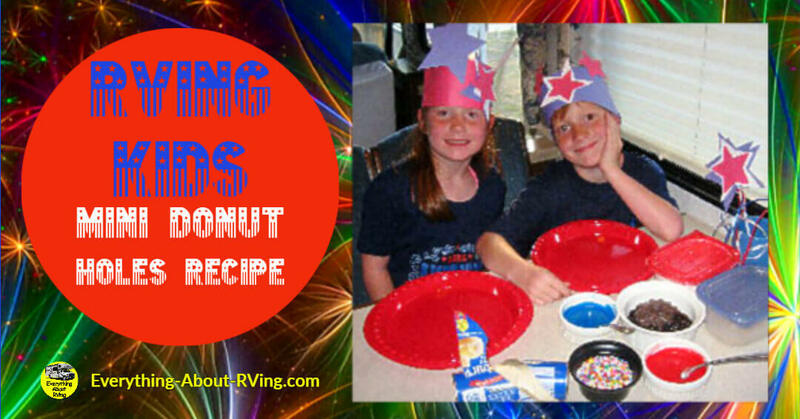 Our Grand kids like to call them Mini Circle Donuts, and like to add a special surprise in the centers. They are very easy to make. 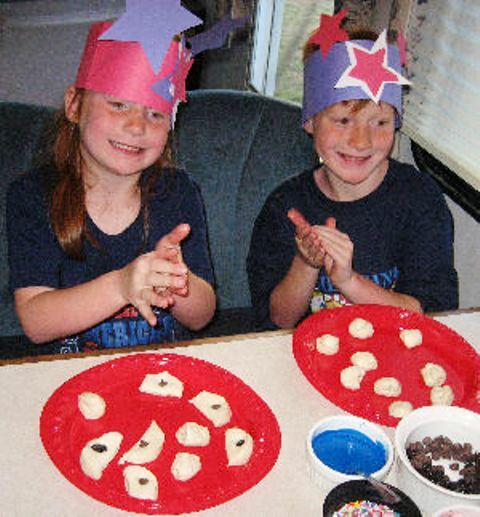 Editor's Note: If you would like instructions on how you and your RVing Kids can make the hats and wands that our Grand Kids have in the picture at the top of this page you should read RVing Kids Independence Day Hat and Star Wand Project. Small Frying Pan, 2 cups of Cooking Oil, spoon with slots so the oil can drain, knife, fork, small plastic container with lid, a couple of paper towels or napkins, and a can of refrigerated biscuits (any kind will do, I use the small cans, they cook faster). For the powder coatings on the mini donuts you will need 1 ½ cups of confectioners powdered sugar and for the Cinnamon coating you will need 1 cup granulated sugar and 1 heaping teaspoon of cinnamon. For the surprise center fillings you will need chocolate chips, M&Ms, raisins. etc. For the holiday frosting you will need red food coloring, blue food coloring and candy sprinkles. Powdered Sugar Coating: In a small plastic container with lid (4 ½ X 6 ½ x3) add confectioners powdered sugar, set aside. Cinnamon Sugar Coating: in a small plastic container with lid (4 ½ X 6 ½ x3) add granulated sugar and Cinnamon and mix until well blended, and set aside. Sugar Frosting: Mix ½ cup confections powdered sugar, 1 teaspoon of milk and mix until a slight runny consistency is reached. 4th of July Red and Blue Frosting : In 2 separate bowls (1 for red and 1 for blue) add ½ cup confectioners powdered sugar and 1 teaspoon of milk. Now add 35 - 50 drops of food coloring. The red food coloring would make a red frosting, the blue food coloring would make a blue frosting,You may add a little more milk if needed. The powder sugar coating will take care of the White in Red White and Blue. Candy Sprinkles: You can also fill a bowl with candy sprinkles and coat the mini-donuts with them. Open can of biscuits and place on a dish. Separate all biscuits and cut biscuits in half. If you are planning to put surprises in the middle of the Donut Holes now is the time to do so. Put your M&Ms, Raisins etc. in now. Pinch the sides of the biscuits to hold the surprise in the middle and roll them up into mini circles. In a small frying pan heat oil over medium heat to about 350 degrees. Cooking time will vary depending on the heat of your oil. 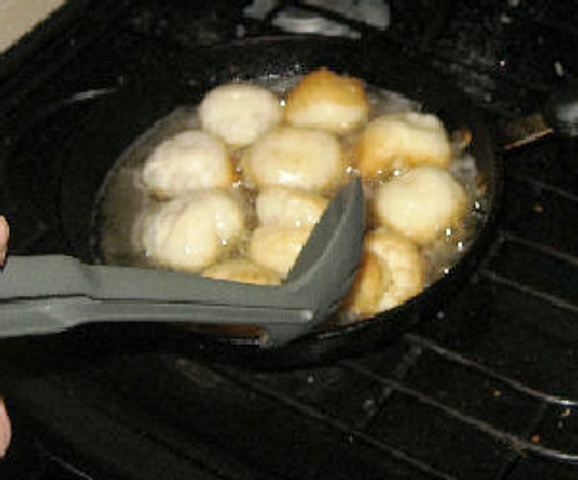 Drop 7-10 of the biscuits circles into the heated oil. Make sure once you start frying the biscuits holes you don’t stop. They will burn very quickly if you walk away. After 1-2 minutes, or golden brown turn the biscuits, cook to other side and remove when golden brown, and place on a paper towel. Dip mini donuts into the frosting mixture or use a fork and let the frosting drizzle over the mini donuts they can now be dipped in the candy sprinkles if desired. Hope you enjoy these mini donut holes!